While packing for our plane trip a few weeks ago, I was looking for one more thing to stick into the girls backpacks to keep them busy on the trip. 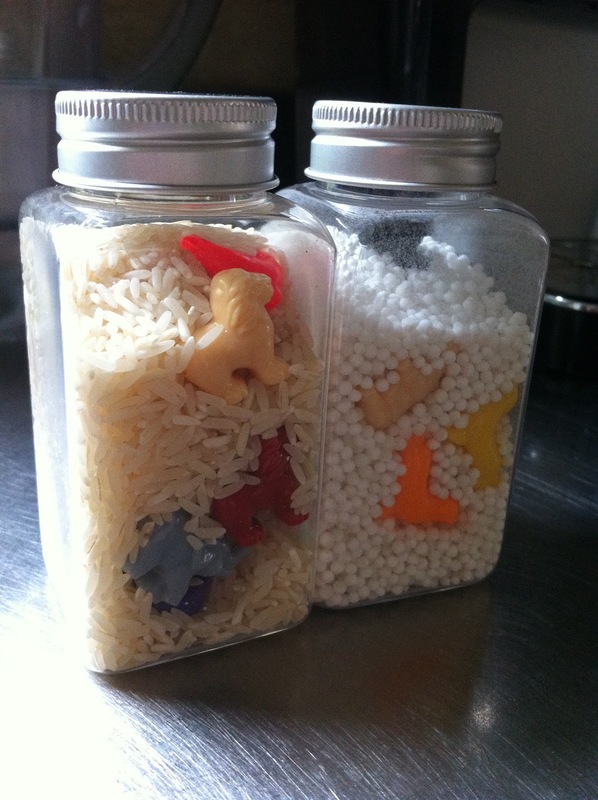 I read about the I Spy Jar that Rachel at a Quirky Momma made and thought they might be the perfect thing. I bought some small plastic jars at the craft store (although you could use some old spice jars, or even plastic bottles) that were just the right size for traveling with. I also bought some plastic animal beads in the jewlery section of the craft store. The beads came in a bunch of varieties, so I got two different kinds to make the bottles more interesting. I then filled the bottles with a little rice, layering plastic beads and rice until the bottle was about 2/3 full. (As a side note I also made one bottle using dried tapioca pearls instead of rice and while it worked well the tapioca over time has left a white residue all over the inside of the bottle. So I think the rice is a better filler.) You don't want to over fill the bottle because you want to have enough room for the objects inside to move around easily. Once the jars were full I hot glued the lids in place and that was it. Honestly the girls weren't that interested in the bottles on the plane, I think there was just to much other exciting stuff to look at. However they played with them a lot on our trip and since we have been home. I also have found that I can't really walk past them with out picking them up. There is something hypnotizing about them sort of like the shaky bottles we made in the winter. This was really simple thing that can make our children happy and learn something by their own. I hope they put some video how to make this nice thing.